I've finally stuck with a Ripple afghan, after many false starts. To top that off, I've posted a picture of myself. Wow! I have to admit I took a zillion photos, trying to get something that felt authentically me. I can't tell you what I went through today, let's just say it was a learning experience. 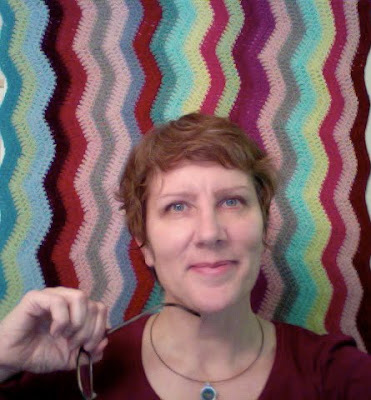 Anyway... the afghan is hung over a door and that's about it's width at this point. The colours are a little brighter than in this shot, but we'll leave it at that. I'm refusing to rip out any more, unless it's a row or two. After all, the idea of the Ripple is supposed to be happenstance isn't it? Someone was laughing the other day, about the fact that I buy yarn, just for the colour and with no idea in mind about what I'll use it for. Don't you wish you had every colour of the rainbow to play with? About my necklace. It's an old typewriter key that says shift. That's my motto for 2010, shift perspective, shift gears, mix it up and be brave. Your ripple is gorgeous. Happenstance usually is the most lovely of all creations. I really like your necklace, too! What a cool idea for a year theme, shift. The ripple blanket is gorgeous, its such a joy seeing things like that grow, isn't it.